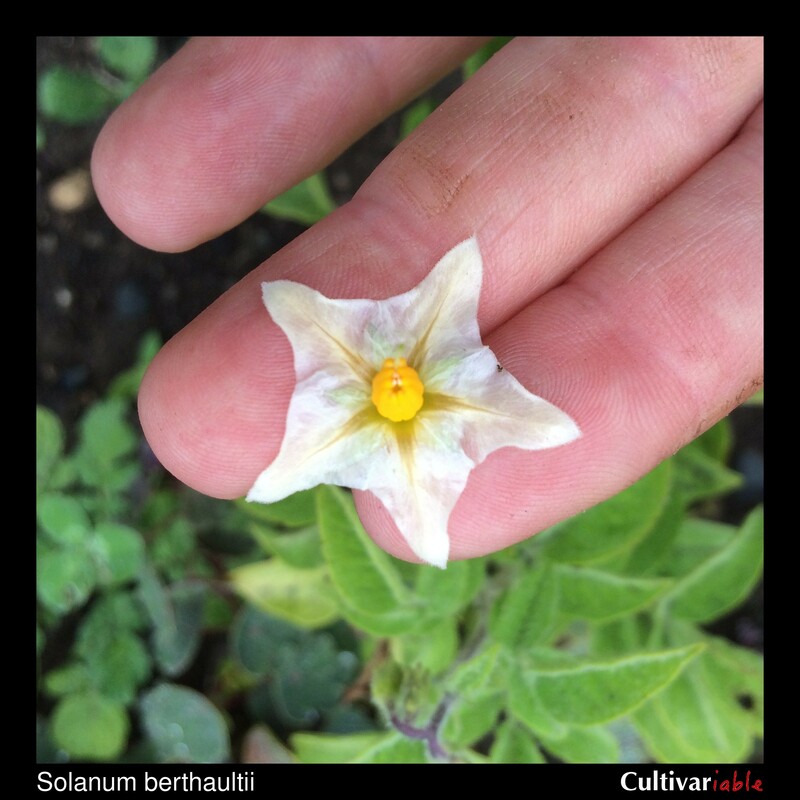 Solanum berthaultii (berthaultii, in honor of French potato expert Pierre Berthault) is native to central Bolivia. It forms large plants, three feet tall or more. The berries are green and speckled. 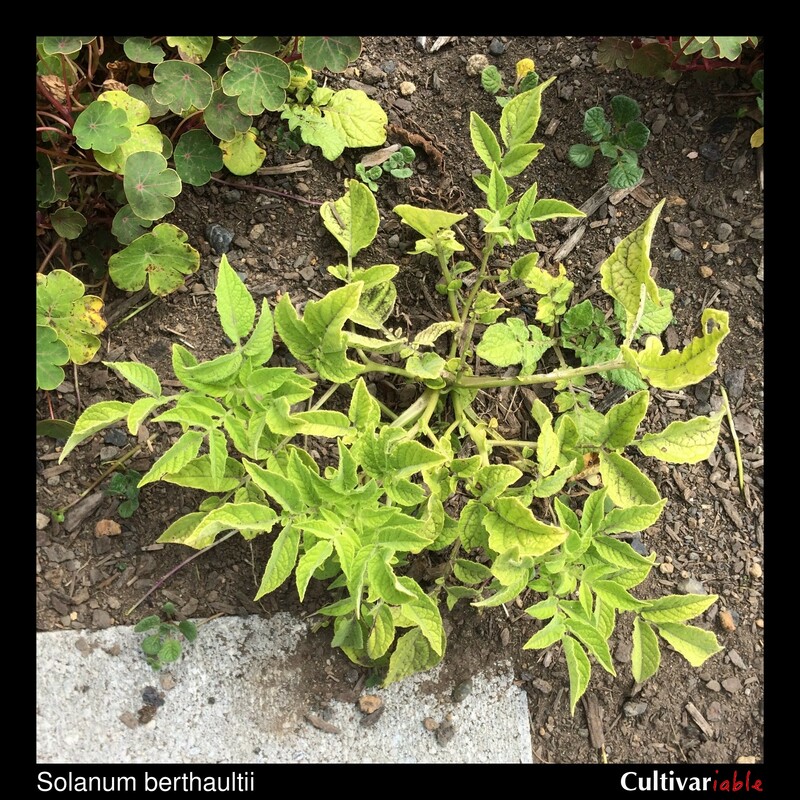 Tubers are round and white, reaching about an inch, perhaps 2 inches in cultivation. Flowers blue to purple or sometimes white (Correll 1962). 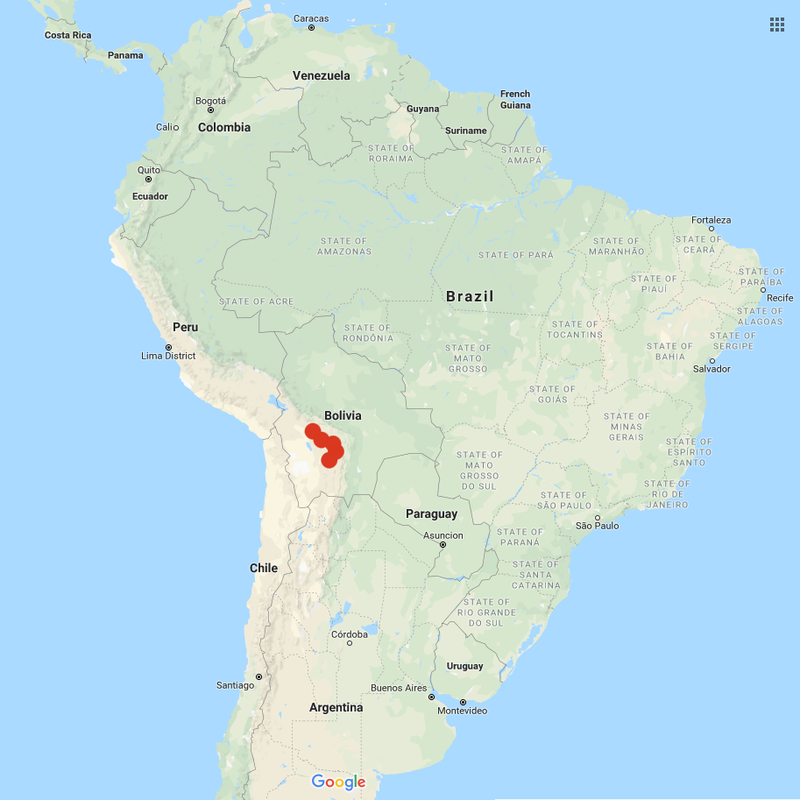 It grows in dry areas, primarily between 6500 and 8500 feet in elevation (2000 and 2600 m) (Ochoa 1990). 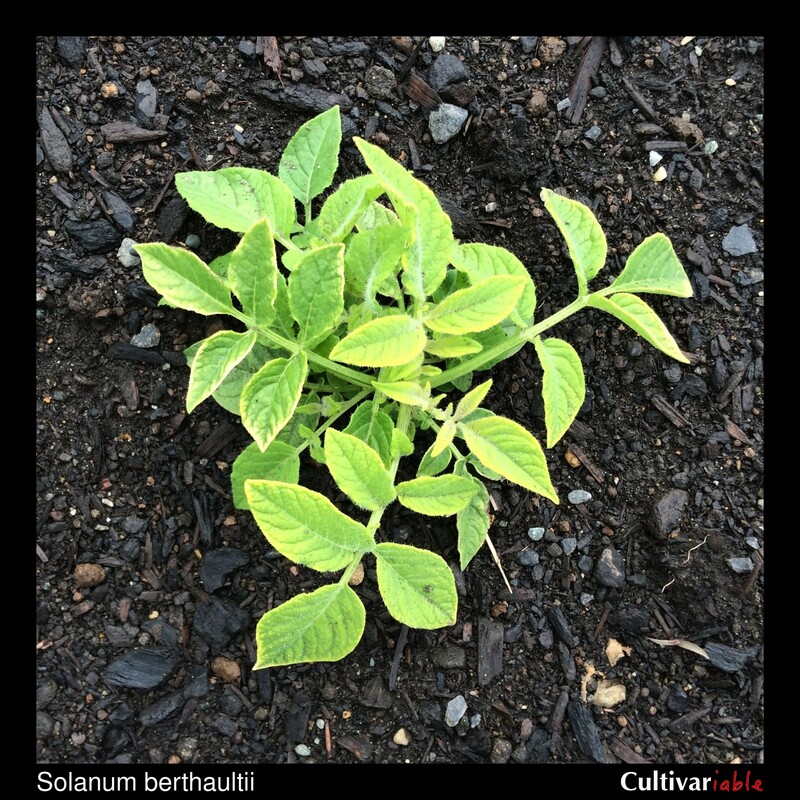 S. berthaultii is thought to be the wild ancestor of the domesticated Chilean potato (S. tuberosum, Chilotanum group) and crosses between the two, using S. berthaultii as the female parent and Andean domesticated tetraploids as the male parent have produced long day adapted progeny with characteristics similar to Chilean potatoes (Hosaka 2018, as S. tarijense). This species has been tentatively classified as not threatened on the IUCN Red List (Cadima 2014). 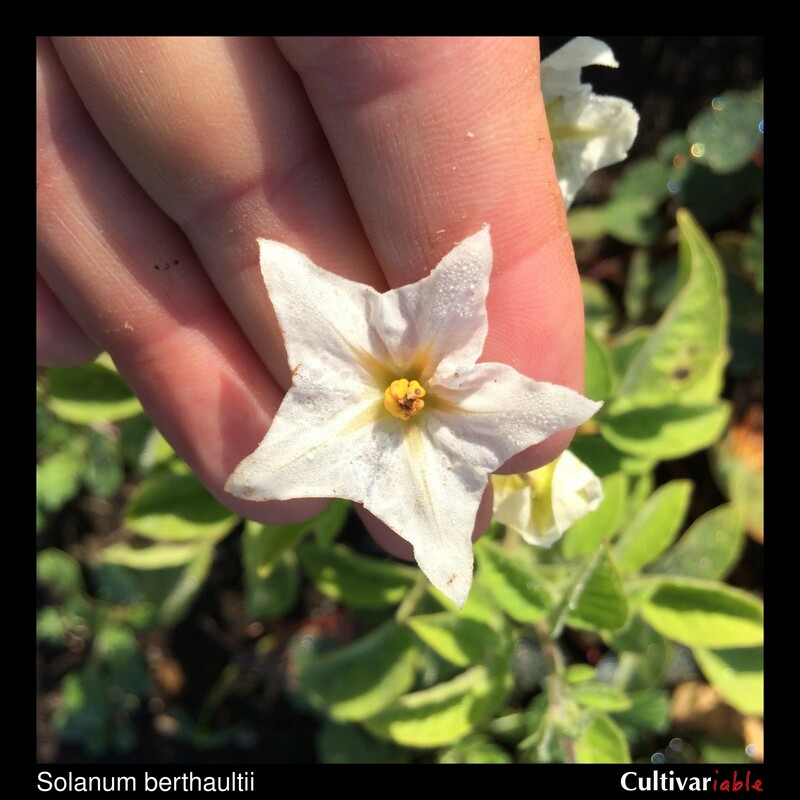 S. berthaultii is of interest to modern potato breeders because its leaves are covered in glandular hairs that can immobilize small insects. This feature could be valuable for controlling aphid infestations and thereby reducing the transmission of viruses. Gibson (1971) reported that 30% of aphids were completely immobilized within 24 hours of introduction onto the leaves. The same mechanism works to deter potato leafhoppers by gumming up their mouth parts, leaving them unable to feed (Tingey 1978). Gibson (1983) found that the leaf hairs also exude a substance that mimics the aphid alarm pheromone and causes them to avoid the plants. 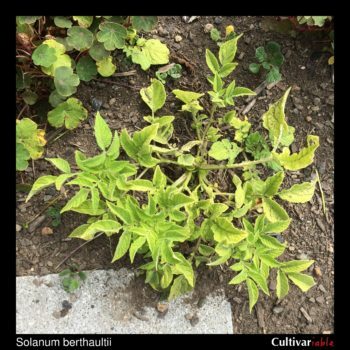 S. berthaultii appears to deter the Colorado potato beetle by emitting a semiochemical (signalling chemical) that the beetles can detect (Pelletier 1999). On S. berthaultii, CPB lay fewer eggs (Wright 1985), the larvae take longer to develop, and larval mortality is higher than for S. tuberosum (Groden 1986). This species can survive frosts down to 27.5 degrees F (-2.5 C) (Li 1977). Vega (1995) found that this species is less frost tolerant than domesticated potato. Because it grows in dry environments, it may also be a useful source of drought tolerance. In a study of early blight resistance, Jansky (2008) found that S. berthaultii (as S. tarijense) was one of the top three most resistant species tested. Tingey (1982) found that accessions of S. berthaultii had different TGA compositions, with 51 of 65 accessions having primarily solamarine and the remainder primarily solanine and chaconine. The lower limit of TGA detected was 5 mg / 100 g and the upper limit was unstated. Gregory (1981) counted the TGA levels in S. berthaultii as undetectable. Van Gelder (1988) found 16mg / 100 g for this species. It seems that S. berthaultii varies quite a bit in TGA composition. It appears that it might be edible, although I have not tested this. I have found seeds of this species easy to germinate using the standard conditions for S. tuberosum. Towill (1983) found that seeds of this species stored at 1 to 3 degrees C germinated at 52% after 12 years and 4% after 23 years. Bamberg (2017) found a 275% increase in seed set in this species with supplemental applications of liquid fertilizer at four and seven weeks after potting. This species typically has five to six months of dormancy. Gibson (1979) found that sticky tipped leaf hairs are a single-gene, dominant trait in S. berthaultii. Gibson (1974) reported that four crosses of S. tuberosum x S. berthaultii produced aphid trapping hairs and that one of the plants produced substantially more of these hairs than either parent. Gibson (1979) found that, in reciprocal crosses between S. berthaultii and diploid S. tuberosum, first generation progeny did not develop sticky leaf hairs, but some crosses made from among the progeny did, suggesting that there is an additional recessive gene at work. Jackson (1999) found 0-13% 2n pollen for varieties of this species.